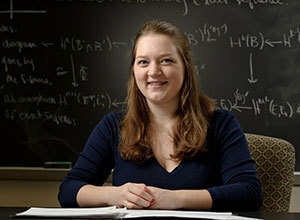 The Winston Churchill Foundation of the United States has selected University of Notre Dame senior MurphyKate Montee as a Churchill Scholar for the 2013-14 academic year. She will use the scholarship to study at the University of Cambridge in the United Kingdom for her master of advanced studies (part III) in theoretical mathematics with a focus on geometry and topology. Montee, a mathematics and music (voice) double major in the Glynn Family Honors Program, is one of just 14 students in the United States selected for the scholarship this year. She is only the second student from Notre Dame to receive this prestigious award. Andrew Manion, who was also a double major in mathematics and music, won in 2009. As a talented and accomplished student, Montee has received several awards and scholarships including the Robert C. Byrd Honors Scholarship, the Notre Dame Provost’s Scholarship, the Notre Dame Reilly Trustee Scholarship and the Bordui Foundation Scholarship. She was also the winner of the 2012 Alice T. Schafer Mathematics Prize, which is awarded to the top female undergraduate mathematician in the United States. She was the first Notre Dame student to win this prize. Montee’s Churchill Scholarship was made possible in part through her participation in Notre Dame’s Center for Undergraduate Scholarly Engagement (CUSE). CUSE provides undergraduate students in all the University’s colleges opportunities for research, scholarship, and creative projects. The center also assists them in finding faculty mentors, funding and venues for the publication or presentation of their work, and promotes applications to national Fellowship programs and prepares them in their application process.